The Midwest Center for Investigative Reporting recently hosted a community breakfast in Tuscola, Illinois, a small town of about 4,000 people in Douglas County. 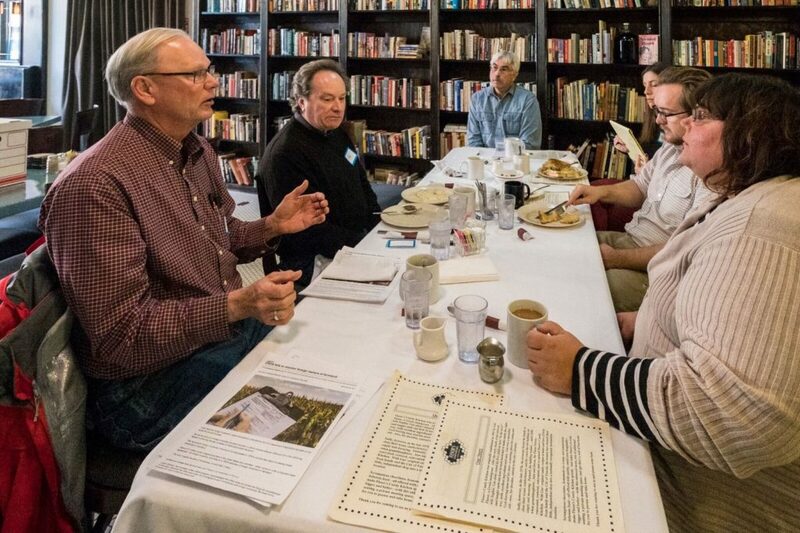 The breakfast was an open to anyone interested in attending, and was part of our ongoing effort to incorporate more diverse voices into our investigative journalism, especially those from the rural Midwest. We hoped chatting over breakfast at Flesor’s Candy Kitchen, a town hub that already buzzes with information sharing among its regulars, would give people the opportunity to share more about the issues they were seeing in the community but weren’t seeing in news coverage. Tuscola’s position in the center of farm country, and the Midwest Center’s focus on agriculture reporting did give us a general sense of some topics that may have been on people’s minds, but we wanted the event to be more about listening than asking questions. The group that came together for our breakfast was small, just five people, but each had a diverse and valuable perspective to share. Some were traditional commodity crop (corn and soybean) farmers, while others represented nonprofits that work with small farms or immigrant populations. Another attendee was a business owner in Tuscola who was mostly interested in hearing what others around the table had to say. It was a group that may have not sat down together otherwise, but after a few minutes the conversation flowed easily. One topic of discussion was misconceptions non-farmers have about farming. There’s a high demand now among consumers for organic, GMO-free products, yet many people are unaware of how hard it can be for farmers to make the switch to organic, much less any type of farming outside what they’ve traditionally done without taking a huge financial risks. Another issue for beginning farmers and seasoned farmers alike that was raised around the table is the cost of land. A large percentage of farmers don’t own the land they farm, and instead pay cash rent. With farming incomes being squeezed, cash rent prices are a major concern, and can make farming prohibitive for anyone just starting out. Other questions came up as the coffee refills were poured, like how a proposed fertilizer plant in Tuscola might affect the town and how this harvest season was different from years past. While not everything shared will become a story, it gave us a good sense of some things that were on people’s minds. But we ended the discussion by asking a question that has been on many news organizations minds recently. How can we maintain the public trust? One man at the table said it’s a simple thing, but any time he sees a story about a farming community that doesn’t name something correctly, like mistaking a grain bin for a silo (here’s the difference, in case you were curious) the rest of the story has lost credibility. Each farmer is different, and has their own way of operating, he said. Avoid generalizations and take the time to get to know how people work. These are things most journalists already strive to do, but it serves as a good reminder, no matter which community we cover. In many ways, the outcomes of the breakfast were similar to a Listening Post we set up at the Urbana Farmers market earlier this summer. There, people had the opportunity to ask questions they were curious about that we took back to our newsroom. I’m currently producing two stories that emerged from questions we received: one about payments to African American farmers from a USDA civil rights settlement, and the other about how corn and soybeans came to dominate the landscape in the Midwest, and the implications of their dominance. In addition to some new connections with the community, we left the breakfast with a few more story ideas. The topic of cash rent, in particular, hit a nerve with the farmers we spoke with: did you know that Illinois leads the nation in the cost of agricultural rent? Or that the average farmer farms for seven different landlords? That’s one story that I plan to pursue that I know the community will have a stake in, and that may not have been on our radar had we not sat down at the breakfast table.